Do you live someplace other than the great Northwest? Go outside. Bask in the sun. Do it for me because I'm counting the days until the weather begins changing from constant rain to a bit of occasional sun. 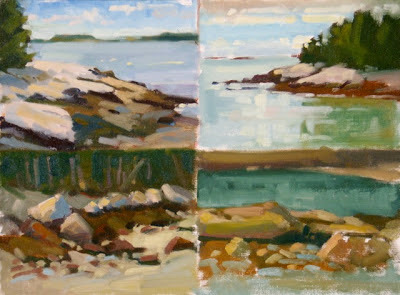 These four studies, done one morning in Maine, are from those glorious sunny days when painting outdoors was actually possible. 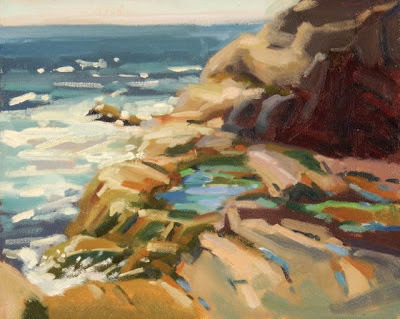 Each image brings me back to the scene I was looking at, with warmth on my face and a gentle breeze blowing.....OK, so there was a slight gale that blew over my easel.....I was still outside painting. 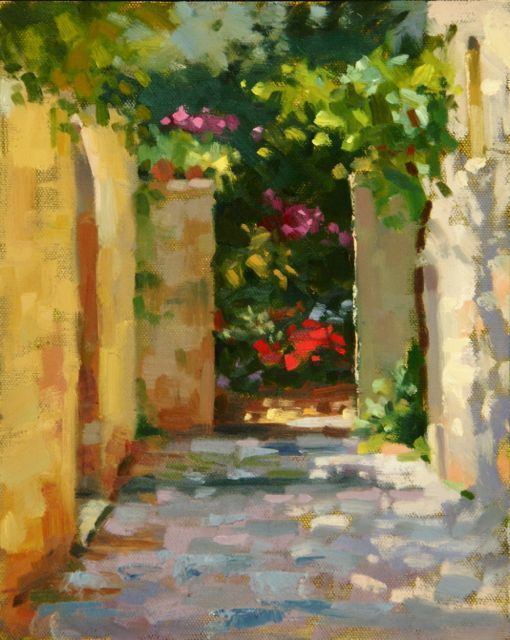 'What Do You Do When You Can't Paint Outside' is the title of my upcoming class beginning on January 17th. 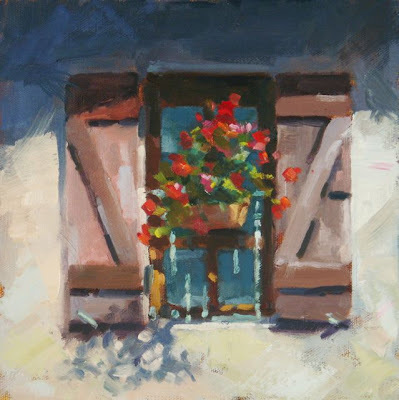 While I will have a couple of still life setups around, most of the class will be about painting from photographs. We will explore the pitfalls of photography and the possible work-arounds that can keep them fresh and exciting. Open to all levels in oil, acrylic and gouache. Find out more at the Winslow Art Center website. This will be great practice for when plein air becomes doable again as the same principles of design, value and color will apply. Come join us if you can. It's wet here. We live in a rainforest....well, pretty near one. During the winter rains a group of us go indoors and paint people. A few weeks ago, this dedicated plein air painter gave up on the outdoors long enough to come and sit for us. This painting was, for two reasons, an interesting learning experience.....well, they all are, aren't they? The first reason was that I drew only three or four placement lines before beginning to paint. 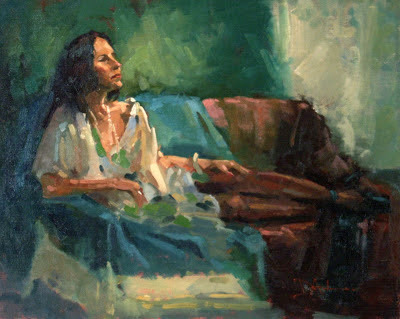 A line to describe the top of the legs, one for the arm she is leaning on and two lines forming a teepee where her head and torso went. And then it was off into paint, beginning with the hair and dark of the cloth and moving into the face. There is another painting under this one that was a reddish kind of portrait. You can see parts showing through and helping with the 'glow'. The second thing that was interesting and a challenge was carving a likeness out of a head that is about an inch and a quarter big....or small. Trying to only use bits of unblended paint when working I found that the slightest error in stroke placement meant losing the image of Sylvia. There are always things I would change in a painting but, overall, I like this piece for the color relationships and brushwork. Here are two more from the miniature show at Roby-King. In the first one I thought the roses would be the attention grabber....but now I think the light dancing on the wall wins the show. What do you think? 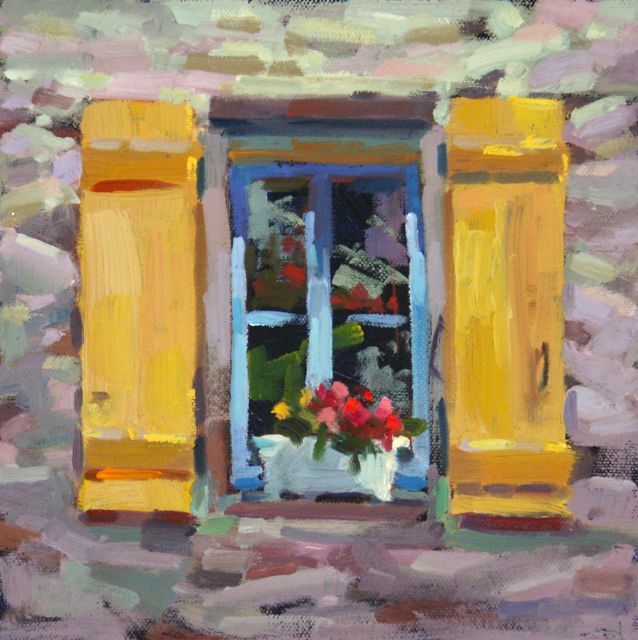 The windows in France, especially in the south, often have flowers in them, on them, around them. They are all carefully tended. There is something so attractive about new young exuberant blossoms being set off by the old and weathered. The Annual Roby King Miniature Show opens this Friday. I submitted five of Provence and am posting two here. If you can come they have hung nearly a hundred paintings from scads of artists. There has to be something there for everyone to see and enjoy. From what I've seen, the prices are very reasonable....and looking is free. Pemaquid Point, Maine. A beautiful and fascinating rock outcropping jutting out into the Atlantic Ocean where, because the rock strata has been tilted allows you to stand touching rock with your feet 80 million years apart. The whole formation is about 500 million years old. Each band catches the light differently varying the color and texture. I got caught up in the colors of all those rocks finding things I never expected to be there. The longer the look, the more was there. I didn't get it 'right'....so I'll have to go back next year and try to bring back a truer feel of this exciting place. 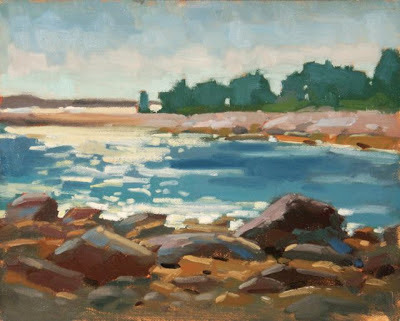 I was painting with my friend Cathe Gill and my new Maine friend and painter, Mary Byrom. Her blog and website are well worth visiting HERE. 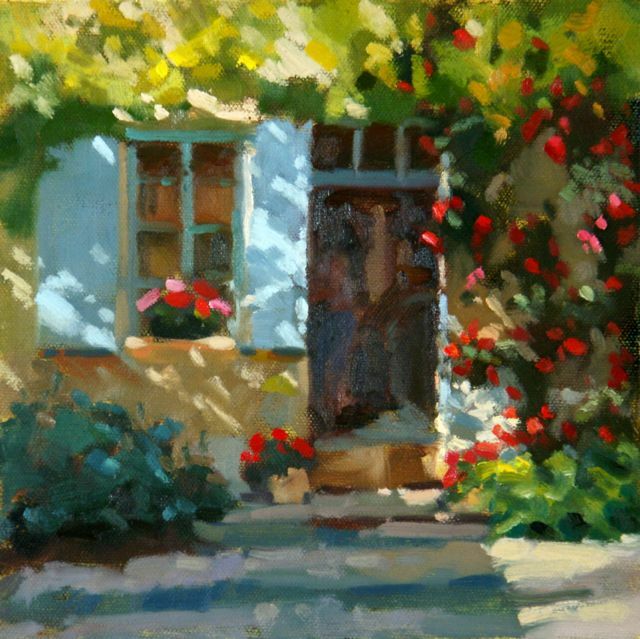 She posts lots of pictures and is a very prolific and talented artist.